I Was Injured after Falling on a Sidewalk in New York? Can I Bring a Slip and Fall Claim? Falls on public sidewalks in New York City are one of the most common types of accidents. To slip and fall or to trip and fall on a sidewalk can result in serious injuries and sometimes death. Whether as a result of negligent construction, maintenance, or repair, sidewalks become broken, cracked, icy and uneven. When sidewalk defects are not addressed in a timely manner, more dangerous conditions such as potholes can developed. Potholes accidents on New York sidewalks are more prone to happen at the end of the winter or the beginning of the spring. During the cold months, water from the snow and the rain finds its way under the NYC pavement through the cracks and other sidewalk defects. As the temperature goes down the water freezes and expands below the pavement, forcing it to rise. The thawing weakens the structure of the soil creating a hole below the pavement. Heavy and continuous foot traffic can then break the pavement and create a pothole. Simply because someone has suffered a fall due to a dangerous sidewalk does not guarantee that a person will be successful in bringing a slip and fall lawsuit against those responsible. New York law requires those injured on sidewalks prove that the person responsible for the sidewalk either knew or should have known about the dangerous sidewalk. A person bringing a lawsuit must also prove that the dangerous sidewalk was a “substantial factor” in causing their injury. In addition, the person responsible for the sidewalk can also point the finger at the injured party and blame them for contributing to the fall by not being careful when using the sidewalk. Some cities or towns have specific laws that determine who is responsible for a sidewalk. Typically, it is either the responsibility of the owner of the property that abuts the sidewalk or the city or town where the sidewalk is located. For instance, in New York City, under New York City Administrative Code Section 7-210, it is generally the responsibility of the owner of the property abutting the sidewalk to maintain the sidewalk in a reasonably safe condition. The one exception to this rule is that the City of New York is responsible for any sidewalk that abuts a one, two, or three family residential home where the owner lives. 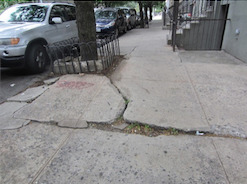 If the City of New York is responsible for the sidewalk, under the New York City Administrative Code there is an additional requirement that must be met in order to be successful in bringing a lawsuit. New York City Administrative Code section 7-201 states that in order to sue the City of New York for the failure to properly maintain a sidewalk, an injured person must prove that the City of New York had received “prior written notice” of the defective sidewalk condition (crack, pothole, unevenness, etc.) that caused the injury. This means that it is the responsibility of the injured person to prove that the City of New York had been informed in writing about the dangerous sidewalk prior to the date of the injured person’s fall. Additionally, when falls occur on the sidewalk as a result of snow and ice, there are other issues that come into play. For instance, an injured person will have to demonstrate that the party responsible for the sidewalk knew or should have known about the snow and ice that had accumulated. In addition, an injured person will also have to demonstrate that the sidewalk was not cleared of snow and ice in a reasonable amount of time. It is important to contact a New York Personal Injury Attorney immediately after suffering a severe injury as a result of a sidewalk accident. Many municipalities, like the City of New York, require that a “Notice of Claim” be given to the municipality after an accident occurs. The Notice of Claim provides information to the municipality, such as where, when and how an accident occurred and why an injured person believes the accident was the fault of the municipality. There are strict time limits for when a party must file a Notice of Claim. For example, in a case where the City of New York is responsible for a sidewalk accident, a Notice of Claim must be filed with the City within 90 days of the accident. As a result of the various laws that apply to sidewalk accidents, it is highly recommended that anyone seriously injured as a result of fall on a sidewalk seek out a highly qualified injury attorney. The New York slip and fall lawyers at Gair, Gair, Conason, Rubinowitz, Bloom, Hershenhorn, Steigman & Mackauf have been assisting those injured in sidewalk accidents for over 90 years. If you or a loved one has suffered a serious personal injury or died as a result of fall on a sidewalk, please contact our firm to discuss your case.